From programming languages to robotics to interaction designs, women have been pioneers in the evolution of computing. But what’s surprising is that only a few women enter computing as a career today. 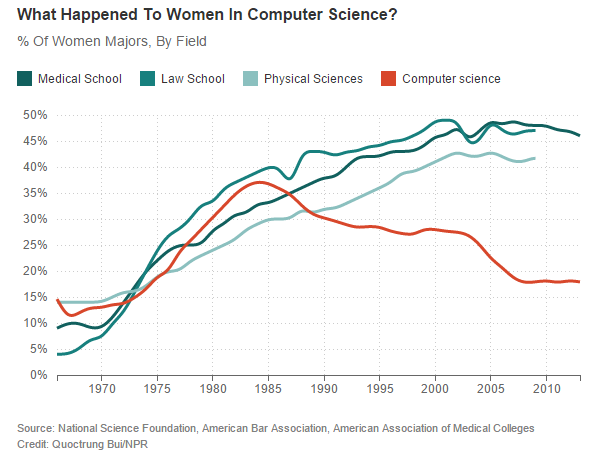 Before the 1980s, many women undertook computer science degrees, but with the advent of the home computer (early 1980s), this number steadily dropped. By the mid-1990s, only 28% of women were studying computer science at the post-secondary level. But despite the under-representation in the field of computer science, web development and other technology-related careers, women still continue to play a major role in these fields. This post shall describe some of the women who made today’s technology possible. 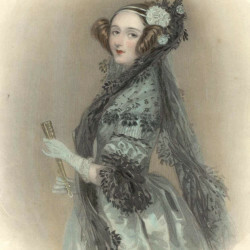 Augusta Ada King, Countess of Lovelace (1815 –1852), was a gifted mathematician and a computing pioneer. She is mainly remembered for her work on the proposed mechanical general-purpose computer, the Analytical Engine, which was developed by Charles Babbage. She translated Babbage’s analytical engine which had been written for a Swiss journal by the Italian engineer Luigi Federico Menabrea. Jean Bartik (December 1924 – March 2011) was among the first computer programmers who developed a technology known as software. She majored in mathematics at the Northwest Missouri State Teachers College. After completing her studies, she was employed by the University of Pennsylvania to work at the Aberdeen Proving Ground, an Army facility based in the United States. She was tasked with manually calculate ballistics trajectories for the Army Ordnance at the facility. While at the facility, she was selected to be among the first group of women programmers for the Electronic Numerical Integrator and Computer. Other members of the ENIAC group were Frances Spence, Kathleen Antonelli, Marlyn Meltzer, Ruth Teitelbaum and Betty Holberton. The ENIAC was invented to calculate the firing trajectories for artillery shells. It was completed in 1946, too late to be used in World War II, but it was a breakthrough in the development of modern computing. The Eniac is even credited as the first all-electronic digital computer. Evelyn Boyd Granville (May 1, 1924) was an African-American educator and mathematician who became the only second black woman to hold a Ph.D. in mathematics (after Euphemia Lofton Haynes who earned her Ph.D. 1943). Granville graduated from Smith College in 1945 in mathematics and attained a Ph.D. in mathematics from Yale University in 1949. Granville joined IBM in 1956 and was responsible for developing computer software that examined satellite for the Mercury space programs. Due to the great demand for scientists and mathematicians in the early 60s, Granville relocated to Los Angeles in 1960 to conduct research on calculating orbits for the Computation and Data Reduction Center of Space Technology. She later worked on the Apollo Project at the North American Aviation where she created computer programs for use in trajectory analysis. Grace Murray Hopper (1906 – 1992) was a computer scientist and naval officer. She was among the first programmers of the Harvard Mark I computer and made known the idea of third-generation programming language (3GL), which paved the way for the invention of COBOL. The USS Hopper and the Cray XE6 supercomputer were named for her because of her achievements as a naval officer and computer scientist. Jean E. Sammet, born on March 23, 1928, in New York City, is a retired programmer and computer scientist. She is best recognized for her work in the FORMAC, the first popular used system for manipulating nonnumeric algebraic expressions. She supervised the first scientific programming group for the company, Sperry Gyroscope (1955-1958). From 1958-1961, Sammet worked at Sylvania Electric Products, serving in different positions. Also, she served as a key member of the committee that developed COBOL. In 1961, she joined IBM where she initiated and pioneered the development of the FORMAC (FORmulaMAnipulation Compiler). In the 1970s, she moved to the Federal Systems Division where she served in different positions relating to programming language matters including Ada. 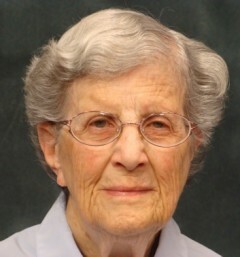 Sister Mary Kenneth Keller, born in 1914, was an educator and pioneer in computer science. She is one of the first women, and probably the first woman to earn a Ph.D. degree in computer science in the nation. 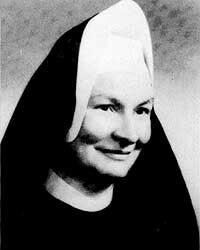 She became part of the Sisters of Charity (Catholic religious order), in 1932 and was ordained in 1940. Sister Mary received a Ph.D. degree in computer science from the University of Wisconsin in 1965. She is known for developing the computer language BASIC (Beginner’s All-purpose Symbolic Instruction Code). The language allowed anyone who could master the language to be in a position to write custom software. 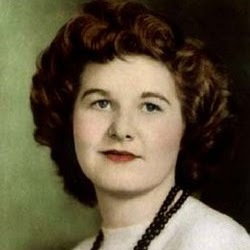 Joan Margaret Winters (September 20, 1924 – January 13, 2015) started working in Computer Services at Cornell University back in 1970. Additionally, she designed and implemented SPINDEX II application for the University Archives and the Department of Manuscripts. She later joined the Stanford Linear Accelerator Center where she worked as a scientific programmer in SLAC Computing Services. Erna Schneider (born June 19, 1926) is a prominent mathematician popular for developing a computerized telephone switching method. Her invention replaced the then hard-wired, mechanical switching equipment, and is considered to have revolutionized modern communication. On Nov. 23, 1971, Erna Schneider was awarded Patent #3,623,007, one of the first software patents ever issued. 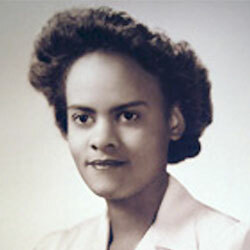 She worked at Bell Laboratories for more than 36 years and was recognized for being at the forefront of major development in the field of computer technology. Frances E. Allen, born on August 4, 1932, Peru, New York, United States, is an American computer scientist. She is known for spearheading most developments in the field of optimizing compilers. She is recognized for her achievement in seminal work in compilers, parallelization and code optimization. Allen also played a role in intelligence work on programming languages as well as security codes for The National Security Agency (NSA). In 2006, Allen became the first woman to receive ACM’S Turing Award. The following year (2007), the IBM Ph.D. Fellowship Award was created to honor her. 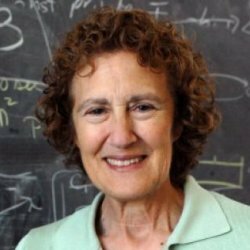 Barbara Liskov (born on November 7, 1939) is a distinguished computer scientist who is currently a professor at the Massachusetts Institute of Technology. Barbara is among the lucky women to be granted a Ph.D. degree in computer science in the U.S. She is a Turing Award winner who is honored for inventing the Liskov substitution principle. In 1976, Winters became a member of SHARE’s Human Factors Project. The group was devoted to enlightening employees of IBM and members of SHARE (an IBM computer user group) about the importance of factors in designing software and hardware and carrying out research into software appraisal tools. She became the deputy manager of the project in 1978 and served as the project manager from 1983 to 1987. Leah H. Jamieson (August 27, 1949) is an engineering educator who currently serves as the John A. Edwardson Dean of College of Engineering at Purdue University. Jamieson attended Massachusetts Institute of Technology from where she received a B.S. degree in mathematics in 1972. In 1974, she received her M.A. and M.S.E degrees and a Ph.D. in 1977 from Princeton University. Jamieson started working as a professor of Engineering at Purdue University in 1976. Dr. Jamieson’s research interests include designing and analyzing parallel processing algorithms, speech analysis and recognition and the application of parallel processing to image, digital speech and signal processing. She is also notable for developing the EPICS or Engineering Projects in Community Service program in 1995. Rosalind Wright Picard (May 17, 1962) is the director and founder of the Affective Computing Research Group at the MIT Media Lab. The group aims at reducing the gap between computational technology and human emotions. She is also a professor of sciences and media arts at MIT. Rosalind Picard attended the Georgia Institute of Technology from where she graduated with a bachelor’s degree in electrical engineering with the highest honors. She also holds masters and doctorate degrees both in computer science and electrical engineering from MIT. 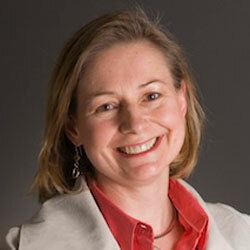 Rosalind Picard is an active inventor who holds numerous patents such as algorithms and non-contact and wearable sensors. Picard’s inventions have applications in health behavior change, human-computer interaction, autonomic nervous system disorders, dementia, and depression. Mary Lou Jepsen (born 1965) is the founder of Openwater, a tech firm that aims to create a device that enables us to see what’s going on in the brain or body with the detail of a high-resolution 3D camera or MRI machine. Jepsen is well-known for her work in inventing display technology when she was serving as the head of display department at Google X and later at Oculus VR. Mary Jepsen holds a Sc.M. in Computational Holography from the MIT Media Lab as well as a Sc.B in Electrical Engineering and Ph.D. in Optical Physics both from Brown University. 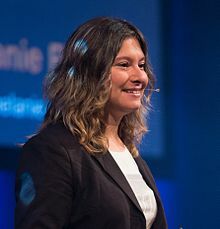 Melanie Rieback (26 October 1978) is a computer scientist and the co-founder and CEO of Radically Open Security, the first non-profit computer security consultancy firm. She is famous for her work regarding the security of radio frequency identification (RFID) technology. Before establishing her company, Rieback worked as an assistant professor of Computer Science at Vrije University, Netherlands from where she conducted RFID security research. Her research which included RFID Guardian and RFID Virus attracted global press coverage and won her several accolades like the ISOC Award and USENIX Lisa Best Paper. In 2010, Rieback was named ICT Professional Expert of the Year by WomeninIT and was among the fifty most inspiring women in technology in 2016. This post lists only a select few of the many women who have played a pivotal role in modern technology.